We have recently discovered an historic Edinburgh City signpost from circa the 1930s, in the depths of our underground vaults. 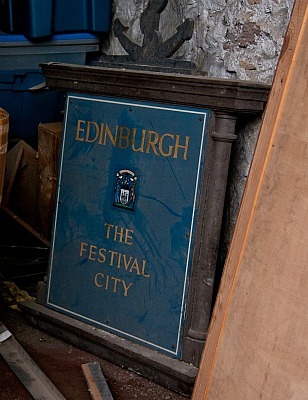 The decorative sign proclaims: “Edinburgh the Festival City” and depicts the famous Coat of Arms of the City of Edinburgh Council. Nigel Hosier, our general manager, recently discovered the remarkable piece whilst archiving some of the material used within our tours which is routinely updated to keep them fresh.